The h2020 DREAM project, through the exploitation of the radio spectrum in D-band (130-174.4 GHz) with beam steering functionality, will enable wireless links with data rate exceeding current V-band and E-band wireless backhaul solutions by at least a factor of 10 and thus, it will bring wireless systems to the speed of optical systems. The DREAM project vision and objectives rely on a power efficient and silicon based BiCMOS transceiver analog front end, operating in D-band and enabling cost efficient deployment of meshed networks with seamless fiber performance. A beam steering integrated antenna array using an intelligent low-cost packaging technology prototype will be developed for the implementation of the beyond 5G network proof of concept in a realistic environment. The main objective of this project is the research and development of advanced, cutting-edge technologies for wireless high data rate communication links able to cope with the requirements of future cellular networks beyond 5G. The increase in wireless communication speed has been almost ten-fold every four years until now. Assuming the development is extrapolated into the future, 100 Gbps wirelessly will appear in around 2020. To date, there is still a lack of technology compatible with the next high demanding telecommunications standards beyond the 5G. Currently over half of the world population lives in cities and urban population accounts for the majority of data consumption and this trend is foreseen increasing in the coming years. 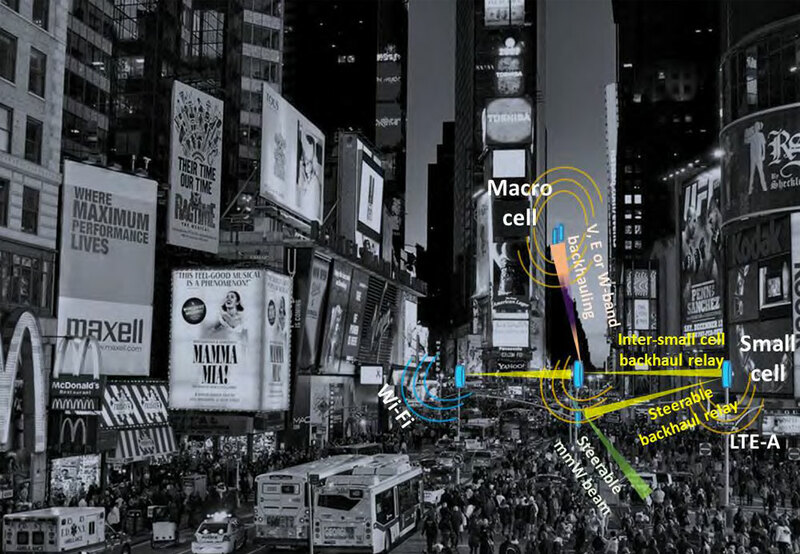 While macro-cell base-stations are typically located at roof-top level, the small-cell access-points are in street canyons where a lot of people in a single location are prone to use high-speed mobile data services, both in uplink and downlink directions. In current and future networks, macro, micro and pico-cell coverage complement each other. New network architectures that can be deployed efficiently will be required to address this very demanding high density urban environment. One of the main challenges in beyond 5G mobile network will be to increase mobile backhaul and front haul capacity for the explosive growth of data traffic. High smartphone penetration and the revenue per user growth are already implying a quick and good broadband services delivery. In this context, the mobile networks operators have to satisfy current subscribers and gain new ones. Small cells are a key enabler of future networks and they are currently a focus of research leading to new challenges for the backhaul network because of their dense deployment. Heterogeneous networks (HetNets) have been proposed to cope with such data traffic explosion issue. In heterogeneous networks, low power nodes (such as small cells) are additionally deployed within the macro cell coverage. Small cells can increase network capacity by offloading the macro cell traffic. A possible 5G small cell backhauling link deployment is pictured in this figure. While fiber-optic wiring is well suited to these applications, the installation cost is high and it is difficult laying optical cable in some location, as dense urban area, where trenching cost can be higher than 150k$/km, or in areas where fiber simply cannot be laid out without significant disruption or environmental impact as for example a wide river. For this reason, there is a need of an ultrahigh data rate wireless solution. 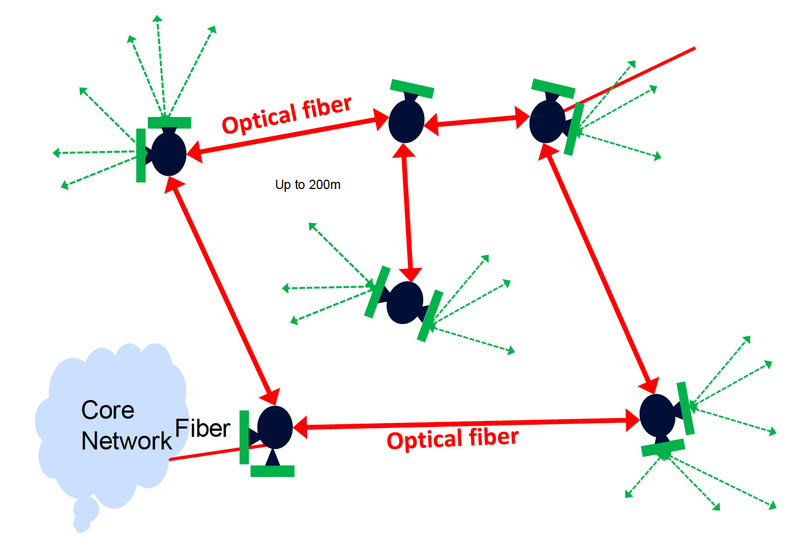 In order to allow the Small Cell backhauling network deployment at reasonable costs with seamless fiber performances, project DREAM envisages the multi gigabit wireless Small Cell network pictured in this figure. The DREAM project will research a wireless link solution supporting data rates up to 100 Gbps covering distances of up to 300 m at ultra-high carriers in the D-band frequency range 130 GHz-174.8 GHz 2. To support such data rates wirelessly, channel bandwidths of many gigahertz will be required. 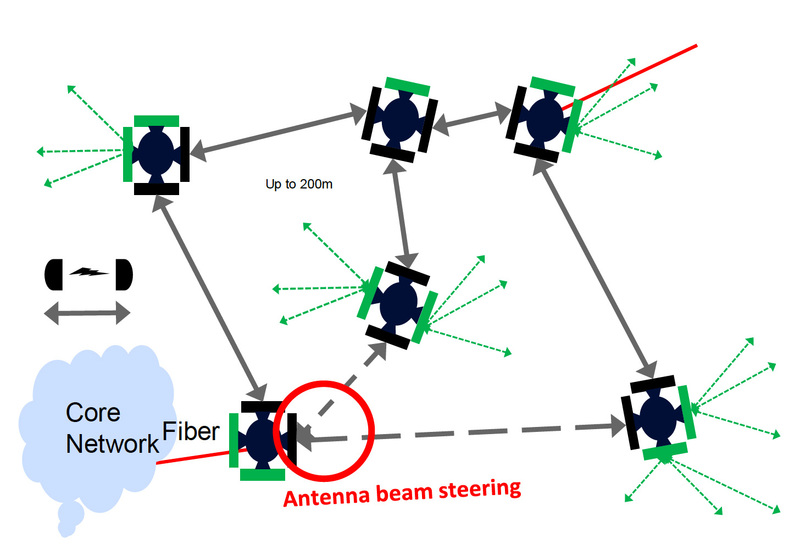 In order to optimize inter-small cell data transferring, to get flexible backhauling and network mesh re-configurability in network approach, an important feature of the link solution will be beam steering functionality.